RadcliffesLeBrasseur is a leading law firm with offices in London, Leeds and Cardiff. Their website was posing a number of challenges. Not only was it a mission for visitors to navigate, it was also a real chore for the marketing team to keep updated. Worse still, there was no sign of it in any of the search engines. Something had to be done, and Figment was the agency with the solution. Website Migration. An Overhaul fit for a Professional Audience. There’s nothing more frustrating than a website that’s really hard to manage. Worse still for visitors who can’t find their way around. Precisely the dilemma reported to us by Sarah Synott, head of marketing at RadcliffesLeBrasseur. 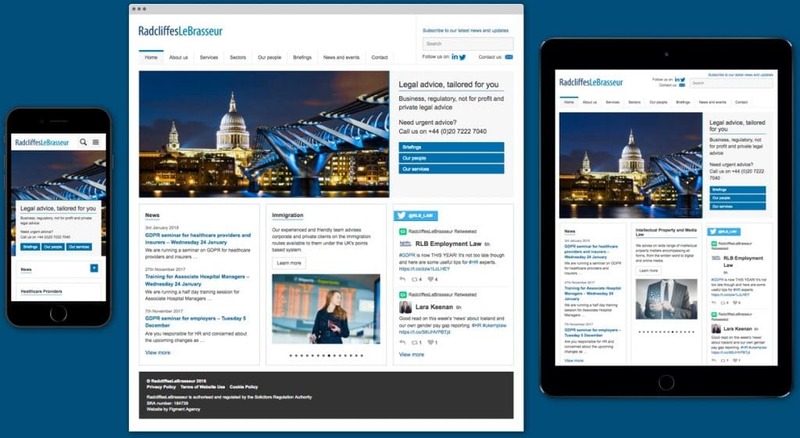 Not only was the website a challenge to manage and navigate on any device, it just wasn’t a good reflection of the firm’s professionally respected standing. Step in Figment. In just three months we transformed the whole experience for both visitor and site manager. How? By seamlessly migrating the entire existing website to a user-friendly WordPress platform. 1500+ pages of content, code and all. Sarah was impressed. Website Re-Design. For Mobile. For Search. For a Great User Experience. The website was given a carefully considered facelift. Now it really did have professional appeal. We overhauled the user experience and made it all mobile friendly. And the benefits continued. The website was previously nowhere to be found in the search engines, but with a few clever adjustments we were able to change all that. Now RadcliffesLeBrasseur was finally on the map. Fully Customised Dashboard. Because Updating a Website Should Always be a Piece of Cake. WordPress is an amazing, globally rated platform. But not all WordPress websites are created equal. It takes a lot of skill and experience to really get the best out of WordPress. Not to mention a great understanding of the needs of the people whose job it is to manage the sites built on it. We wanted to make sure Sarah Synott and everyone responsible for managing this law firm’s website were happy in their work. 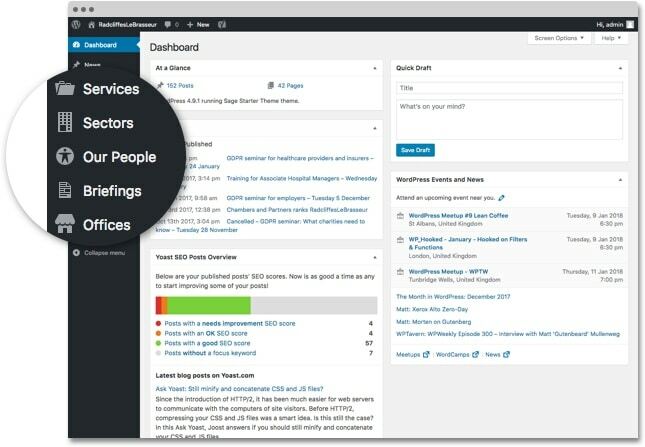 So we set about custom designing the WordPress dashboard for them. Our goal was to make updates a piece of cake. We carefully thought out and labelled the editable sections of the site, applying easy-reference icons to enhance simplicity. The result is a site that everyone loves to use, where Sarah says that updates are a pleasure rather than a chore. Figment re-built our website to make it a more user friendly, better designed site which is now optimised for tablets/i-pads. Moving the site to Word Press has made it more Google/SEO friendly too. It was a bigger project than predicted but the developers at Figment worked closely with our own team to get the result we were aiming for.